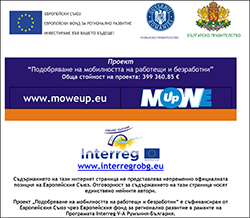 On May 17, 2017 Non-profit organization “European Institute for Cultural Tourism “EUREKA” started the implementation of "Joint services and initiatives for sustainable employment and labor mobility in the cross-border region of Dobrich region and Constanta district" project, acronym – LAB mobile, under the ”Interreg V-A Romania - Bulgaria” Programme. The Projects aims to stimulate the labor market in the target cross-border region, creating long-term conditions for labor mobility, employment and entrepreneurship through innovative and sustainable cross-border initiatives. Elaborating 4 modules for tourism entrepreneurship and 3 educational films for eco and rural tourism, cultural tourism, sports tourism and adventure tourism that will be widely available on the e-learning platform. Conduct three joint trainings. Beneficiary 4: The “Institute for the Promotion of Tourism and Applied Economy” Association, Constanta.